[John B] is a software engineer and had some spare time on his hands, so he started messing around with his Kinect which had been sitting unused for awhile. He wanted to see what he could create if he was able to get Kinect data into a virtual environment that supported real-world physics. 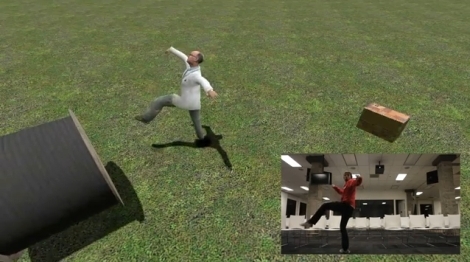 The first idea that popped into his head was to interface the Kinect with Garry’s Mod. If you are not familiar with Garry’s Mod, it is a sandbox environment built on top of Valve’s Source engine. The environment supports real-world physics, but beyond that, it pretty much lets you do or build anything you want. [John] found that there was no good way to get Kinect data into the software, so he built his own. He used OpenNI to gather skeletal coordinate data from Kinect, which was then passed to some custom code that packages those coordinates inside UDP packets. Those packets are then sent to a custom Lua script that is interpreted by Garry’s Mod. The result is just plain awesome as you can see in the video below. Instead of simply playing some random game with the Kinect, you get to design the entire experience from the ground up. The project is still in its infancy, but it’s pretty certain that we’ll see some cool stuff in short order. All of the code is available on github, so give it a shot and share your videos with us. Hmm. I’m trying to install OpenNI to play with skeleton tracking — given the video it just looks “ok.” It seems to think his elbows are much higher than they appear in the video. Must … add … input … filtering …. I wonder what the bottom of that avatar’s shoe looks like. This + LCD goggles and a large room = The Matrix. now i gotta find a kinect to buy for no reason except silly drunk fun. That song is on every Garry’s Mod video. Just need some way to make your feet hurt when you kick the boxes. Right, that’s it. Next payday, I’m picking up a Kinect. Seems this would be fun to play with in the environment…. That is insanely awesome. Like people said before, this+VR goggles. this could make the various fighting games interesting. Win with awesome-sauce on top. Crowd-sourced zombie movie – GO! …yeah, I’m sold. I want a Kinect now. might want it a little bigger in diameter….maybe with some curve to get some wrap at the top? on top of one of these…. Now we just need to cover sensation, somehow. And smell. Hearing and vision we can do any number of ways…but touch and smell? Not so much. YES. MUST GET KINECT NAO! is this only for osx?!? Yeah it is only for osx.e Dont worry though, kinect’s tracking on computers isn’t very good, quite buggy. Grr. I love re-writing code for other platforms. I love re-writing code for other platforms. I love re-writing code for other platforms. I love re-writing code for other platforms. I love re-writing code for other platforms. Maybe If i say it enough I will like it. If I do get it going on 7 I will post in forums k? That’s amazing. Just need some goggles and it would be like virtual reality. I NEED THIS KINECT! i already have a xbox 360, so i can use other hacks 2.